This is my musical way of remembering these absolutely lovely (sunny, breezy, and relatively cool) days of summer that we have been (briefly) having here in Illinois. You can download a PDF of the music here, if you want. "I'm not essentially a happy person, but I have all kinds of joy. And there's a difference, you know . . ."
You can watch Orson Welles' final performance, an interview taped just two hours before he died, right here. Here is a violin game (an adaptation of the classic game "Giant Steps") that can help little fiddlers' fingers feel the difference between half steps and whole steps. Teacher: Molly, take two giant steps on the A string. Teacher: Molly, take two baby steps on the D string. Teacher: You forgot to say "Mother may I."
. . . and we try again. It is far easier to remember what a half step feels like compared to a whole step than to remember to say "Mother may I." Teacher: Molly, take one giant step and one baby step on the G string. This game would probably work well for a group of children. You could even devise a way for the ultimate reward to be a recognizable tune--made of half steps and whole steps. "Go on Singing. Maybe a man's name doesn't matter, all that much." Last night I watched Orson Welles' F for Fake, which is a unusual and spectacular film from 1974 that he wrote with Oja Kodar about fakery in the worlds of art, biography, and film. It is also Welles' confessional about his own past as a kind of charlatan--as a "failed" artist, and as an accidental actor. His final statements about art and identity are astounding. This is the film's original trailer (the trailer, for whatever reason, is in black and white, while the film is in glorious color). Welles' had a career-long passion for magic, and the film begins with a series of magic tricks. Here is a clip of some of Wells' earlier work as a magician. There was a hefty stack of my brother's piano music in the boxes of music from my father's basement that we brought back to Illinois with us this week. I am now the proud custodian of enough piano music to keep me occupied for a lifetime (or the rest of mine). I especially like the Henle editions of Beethoven and Bach (yes, the hardbound volumes of the WTC that I wondered about in a post back in May). Today I decided to try my hand (or hands) at a few Chopin Mazurkas, and to my surprise and delight I was able to play them. Chopin is great fun to listen to, but it is even greater fun to play. I was surprised to read the dedication above the 5 Mazurkas of Opus 7 was to a certain Monsieur Johns de Nouvelle Orleans. (Not this Mr. Johns.) The only thing we really know about Chopin's Mr. Johns is that his name was Paul Emil Johns, he was born in Krakow in 1798, lived in New Orleans for a while, and died in Paris in 1860. Chopin and Johns probably met in Paris, and through their association dubious rumors began to circulate about the possibility of Chopin moving to America. It is certainly interesting to listen to the first Mazurka of Opus 7 in connection with the music that we so often associate with New Orleans. From all the people who have worked so hard (like Oliver Sacks and Daniel Levitan) over the past few years to figure out how music affects the brain, The Music Instinct is an absolutely fascinating program. It addresses, by way of all kinds of scientists and sciences (even string theory), the evolutionary role of music as shown in the physiological record of Neanderthals, the musical life of birds, and the ever-present existence of musical vibration in the universe. I am so grateful to have seen this program, particularly since these very smart scientists discuss concepts that I have pondered for most of my life in scientific terms and with practical applications. There is also some fantastic Beethoven played by Daniel Barenboim, and a surprise performance by the doctor who fell in love with the piano after getting struck by lightning. I'm certainly getting a copy to show to my classes (and to share with my family). We always take the same summer vacation. We go to the same cities and see many of the same people. We take the same routes, drive in the same car, and we stop at the same rest stops. On this trip back we even had the same person take our (same) order at Taco Bell. The sameness of it all helps offset the differences. We see how places change year to year. We got to experience the Charlie Card in Boston, though it seems not be common knowledge that the "Charlie" in the Charlie Card comes from the Kingston Trio's classic song Charlie on the MTA. Very clever. Having spent a large chunk of my life riding on the M.T.A., which during my childhood became the M.B.T.A., and during my young adulthood became known simply at the "T," I have a lasting love for public rail transportation. Sweeping changes in the seat color and the quality of the station announcements on the New York subway always amaze me. During the 1970s the subway lacked all glamor. It still lacks glamor (which is one of the things I like about subway travel), but it seems far more civilized. It is still odd to me to hear piped-in Beethoven violin and piano sonatas in the Port Authority. I find myself looking for speakers so that I can actually listen, but then I feel weird. And then I bother myself thinking about who might be playing. Live musicians in the T stations in Cambridge make everything more straightforward, though Michael and I seemed to be the only people listening to the young woman with a guitar and a speaker that had additional tracks of her voice singing "Country Roads," while we were waiting for the Red Line to take us back to Harvard Square after eating fantastic (vegan, on my part) Cambodian lunch with T. and her husband, Mr. T.
Being somewhere without an instrument and without a musical purpose (or even a blogging purpose--I didn't bring a computer, and only spent a few minutes on Michael's computer during our journey) was not as difficult this time as it has been in the past. Slowly I am learning how to view myself as something other than only a musician, and am learning to be less restless when I am not practicing or writing. I find that defining myself by what I "do" rather than what I "am" leads to a great deal of unhappiness and discomfort in the non-musical "real" world. We were able to see the movie Food, Inc. when it opened at the Coolidge Corner in Brookline (Mass). Driving westward the next day, and seeing the farms that had cows eating grass (as they should) suddenly be replaced by huge fields of corporate genetically-modified cattle feed (the corn and beans fields that fuel the local economy) gave me a more immediate understanding of the impact that a few money-making corporate entities can have on the world. I came away from this trip realizing that it is fine to make a difference in the world in a small way (as suggested by the movie), and in a remote place (both musically and in my personal carbon footprint). I think that making decisions and mistakes that affect (benefit or hurt) a lot of people is far too much responsibility to make room in life for free creative thought. Being a free creative thinking person is a tremendous luxury, and it has value that is not measured in dollars and cents. Speaking of free thinking, it is time for me to mow the lawn, an activity that helps my mind become even more free, at least before it rains or gets too hot. The spoils of my morning walk left two words on an index card: commercialism and legacy, which is what I suppose I was thinking about this morning, before I started to practice. Now my mind is filled with Bach (on the viola) and paying attention to the way double stops feel on the right hand on the viola compared to the way they feel on the violin at the sounding point. The monologues that I have during my walks always seem profound, but, like the dreams I have at night, they never feel quite the same after they have been translated into sentences and paragraphs. We live in a history-obsessed culture. It is especially true now, because history is delivered to us so easily through books, television (and video recordings), audio recordings, and the internet. We also have a history of commercial culture through archived magazines and newspapers, archives of television shows, commercials, and more than half a century of news footage. If it was sold or used to sell something, someone probably has access to it; and someone can probably reproduce it (unless it is something that has flaked off a reel of magnetic tape, was destroyed by fire or flood, or the paper it was written on had already decomposed). Our culture is obsessed with the ideal of legacy and afterlife. The idea of an afterlife, whether through reincarnation or resurrection, draws people into the arms of religious organizations that offer promise for some kind of "future" after death. It is even true with Judaism, which is not an afterlife-based religion. During every Shabbat service, Jews who go to synagogue remember those in the congregation who have died in previous years during the current month, and Jews often celebrate the anniversary of a person's death with the lighting of a Yahrzeit candle. Every practicing Jew knows that s/he will be remembered, as long as there is a continual congregation to keep his or her memory alive. And then there is the idea of cryonical freezing, which involves a large monetary investment, and a great deal of faith in the organization doing the freezing. Most musicians who lived before the 20th century knew that their time to perform was limited to a few good decades. Their idea of leaving some kind of a legacy was to have children, teach students, write music, and write instruction books. I don't really know if the idea of leaving a legacy was a motivating factor for many of them, though preserving impressions of a way of life that was clearly changing (due to technology, war, musical taste, or politics) might have given them good reason to write. It seems that for a long time any kind of lasting legacy for musicians, aside from having children and teaching students, involved some kind of a commercial endeavor. In order for a composition to survive, it had to have a publisher. The publisher would sell it to make money, and the composer would get a cut. It had to be useful music, and it had to be good. It really helped if the composer was already well known, or knew someone who was well known to recommend him (or the occasional pre-20th-century her) to a publisher. In order for a musical memoir to be published, the person writing it had to be a significant enough person for a publisher to invest a serious amount of money into having it printed, bound, and sold. A person of little commercial significance would have a very slim chance of having his or her memoir published, unless there was a personal investment on the part of the writer or the writer's friends and/or family involved. Before the 20th century, most biographies were about people who had already died, and many must have been about people who didn't think of their lives as being "an open book," as it were. Some were written by people who knew the subject for a long time, and some were written by total strangers. Biographers use information taken from diaries, which people often keep as a way of documenting impressions of events and preserving personal feelings that can not be shared with others (for various reasons). Letters are also important source material for biographies. The most valuable biographical material comes from personal letters, written to people long dead who might have saved them for posterity (or for sale), even though the letter writer might not have intended the material in them to be read by anyone except the recipient. I can't imagine that Mozart intended the contents of his letters to his sister for any eyes except her eyes. Someone who didn't know Mozart really well might judge him unfairly. We are fascinated by "dirt" about composers we love. I am certainly fascinated by reading things I shouldn't know about composers' lives. There is no literary genre I enjoy more than the musical biography, except, perhaps, the musical memoir, books of letters, and the occasional musician's diary. With every kind of media at our fingertips, we are surrounded by biography. We love the idea of watching biography as it happens, and people go out of their way to take part in historic moments. There are people who have their most private moments preserved on film (actually video), and there are people who have those moments (or hours, or days, or even years) broadcast on television for commercial use. The idea of legacy seems to have taken even more of a turn towards the commercial, as we see commercial entities pay large amounts of money for biographical material. There is money to be made, for the time being, on mothers of sextuplets and octuplets (a word that is not yet listed in my computer's dictionary), but this too shall pass. My interest in legacy has mostly to do with musicians, and I believe that there is a great deal of value in hearing and preserving audio and video recordings of people who are no longer alive, as well as hearing audio and video recordings from people who are still alive, but no longer play or sing. I also enjoy seeing YouTube videos of musical children as they grow and develop as musicians. I love the fact that it is now possible, by way of the free spaces on the internet (like blogger and YouTube), for people to leave a series of "snapshots" covering what they did in their musical lives (or what they are doing with their musical lives) without having to be judged as not being important enough by commercial entities. And this accumulation of musical legacies makes for a very interesting future, provided that there are large spaces on the internet that remain free of commercialism. Bring the above excerpt (measures 35 and 36 of Debussy's Clair de Lune to a piano, and listen for the phantom C on the second beats of both measures. The D flats at the ends of both first beats definitely resolve to C, as a result of the soon-to-be-arpeggiated F minor chords in the left hand, but the magic happens without the piano key being touched, and before the middle C in the left hand is sounded. Perhaps the magic of Debussy is partially in the notes that the fingers never touch. The word boondocks is a relic of American colonialism. British English imported lots of words from its far-flung colonial possessions, but American colonial aspirations mainly produced words derived from Spanish and adopted with the settling of the West. This one, however, is an exception. It derives from the Tagalog word bundok, meaning mountain. It was adopted into the language by occupying American soldiers in the Philippines as a word meaning any remote and wild place. By 1909, only some ten years after the American conquest of the islands, the word had caught on enough to rate an entry in that year’s Webster’s New International Dictionary. Despite this, however, it remained primarily a military slang term, especially among Marines, until the 1960s, when, probably because of the Vietnam War, it gained wider, civilian usage. To my friends and family on the American East Coast, I was headed with my husband off to the boondocks in 1985. All I knew of Illinois was Chicago, which is a good four hour drive from here, particularly taking traffic into account. I much prefer to get there by train. There is a train that leaves from here to Chicago almost every day, and there is even one that brings you back. My previous small town experience was in Austria, in a town of 4,000 people, equally as far from Vienna as my present town is from Chicago, that had both a brewery and several excellent bakeries. I didn't even need to have an oven in Austria, though I did have a chance to learn something about Austrian baking from one of my colleagues. One of the first things I learned to do when we got to our small Illinois town was learn to make clothes and bread. I kid you not. Good bread was nowhere to be found, but fabric stores were plentiful. I also wrote a very useful book for teaching flute, and found a good number of students to teach. The flute teacher on the faculty of the local university spent more time and energy on his rather successful "side business" than he spent on his students. Anyway, he left town a few months after I arrived, and I soon found myself with a healthy handful of university students who had been suffering from serious flutistic neglect, as well as a few beginners, and some high school students. It amazed me that my flute-playing high school students were considered "cool" by their peers. They were also well respected by adults in the community. When I went to high school in the Boston suburbs, being a musician was anything but cool. But here it was. And band was a really big deal. I was also welcomed by the local alumni branch of Sigma Alpha Iota, a group of dozens and dozens of women who had a pot luck dinner in my honor (I only realized this in retrospect--I thought they did this all the time). This group of women held monthly concerts in various locations in town. I was encouraged to join this fraternity (I had never heard of it before), and had to take a test and go through an initiation. I felt rather foolish, but these people were so nice to me. It was the least I could do to join their organization. I was very impressed with the local string culture: there were a lot of university faculty people and spouses of university faculty people who played in the university orchestra, and, because none of the university students were capable of playing the flute in the orchestra (yes, their situation was pretty dire), I played in the orchestra for a while. Within a few months my inherited students could play well enough to keep up with their peers, and I devoted most of my attention on trying to find places to play my baroque flute, especially when I realized that my bachelor's degree from Juilliard was not sufficient to get me a job at the university. 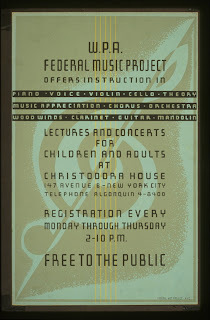 I also started working at the university radio station, which had just started a classical music program. There was a great organist on the university faculty who bought a harpsichord with a keyboard that could convert to A=415, and one faculty spouse who happened (can you believe it?) to play baroque violin, and another who was happy to tune her cello down a half step and use a baroque bow. We had a few good years and played a lot of good concerts. 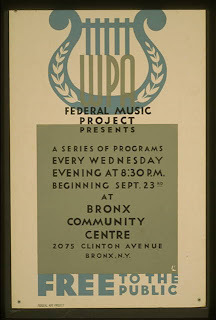 We had a great deal of community support, and our concerts always had good-sized audiences. Our ensemble ran its course: some members retired and moved away, and I, needing a ladder of escape from the 18th century, started playing the violin. 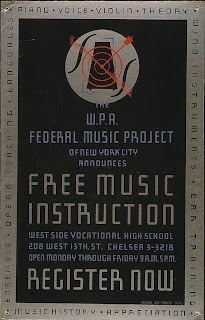 A few years later I started playing in a string quartet, and we were artists in residence at the community college where I now teach music appreciation. We had a pretty successful chamber music series, until the person on the community college board who was most interested in having the concert series retired, and its biggest benefactor died. Like the faculty members of many small university towns, concert-going faculty members retire and move out of the "boondocks." Audience members also die. In the musical community of a small town like this one, every death is a lasting and major loss. A significant part of the audience for classical music in a university town consists of university students. Their absence from the audience when they graduate is certainly felt, but it is not mourned. It is also usually renewed with another self-selecting group of young people who care about music. Aside from occasional musicians for weddings and funerals, the only people who make money from music around here are the people who teach: university professors (and adjunct faculty) and private teachers. The university started charging money for concerts a few years ago, but it hasn't improved the quality of the concerts. The idea of selling tickets has, it seems, grown the audience for orchestral concerts. Perhaps the ticket-buying public believes that something that costs money must be worth more than something you can get for free. Thank goodness there are still people from the "old days" who know this isn't true. 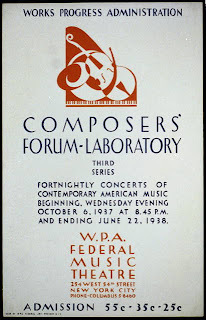 The suggested ways of increasing the audience for classical music discussed around the musical blogosphere seem to be centered around cities where musical success is measured in dollars and cents; where there is competition for a piece of the musical pie. It seems to see the "audience" as "customers" who could just as easily spend their money on some other form of entertainment. My small town experience (and the parabolic curve works the same way in small towns as it does in big cities) tells me that the people who want to listen to classical music will seek it out. You can expose every grade-school child in town to classical music, but only a small number of children will find meaning in the experience. And perhaps some people in that handful of students will grow up loving music. Music lovers are a small and self-selecting group, and they live everywhere--even in the boondocks. "Your job, and it's not a job--it's a sacred calling to keep people up at night." What about the future of music? Robert Levin tells the musicians who graduated from Curtis last month what they need to do in order to keep music continually alive and continually relevant. Levin's 14-minute address is something that every musician should hear. Pass it on to your friends. Pass it on to your students. And follow Levin's advice, which is not only meant for the elite handful of this year's Curtis graduates, but for all musicians at every stage of life. Now that all is said and done, it is very interesting to listen to the preliminary performances of the pianists who entered the Van Cliburn competition. I don't spend a great deal of time reading current fiction, and, with some exceptions, I find that most recent novels that have musicians as main characters tend to show a less-than-plausible musical life. It sometimes comes from a lack of musical understanding; an inability to maintain the necessary balance between the idealistic, romantic innocence and the pedantic drudgery that real musicians carry with them everywhere they go, and it sometimes comes from a musician-writer's lack of experience with using language to express what is more easily expressed through music. Eva Hoffman, who has a deep understanding of music and a truly musical way of writing, explores many of the serious questions that musicians find themselves thinking about again and again. Without sounding precious or pretentious, she deals with musical subject matter (and other matters of subjectivity) in a plausible way. Her use of language is exceptionally beautiful, making the novel a joy to read. Hoffman, a pianist herself, who abandoned her dream of being a professional musician when she left her native Poland at the age of 13, seems to have fashioned Isabel Merton, the main character of the novel, after an alternate version of herself, working out an idealized dream of life as a successful, intelligent, insightful and beautiful pianist (with a fine and understanding manager) who is recognized and respected internationally for the beauty and depth of her playing. The novel, which is organized like a piece of music, in a kind of rondo form, perhaps, takes place during one of Isabel Merton's concert tours through Eastern and Western Europe. Isabel's travels from city to city are separated by transitions (Hoffman labels these transitions appropriately as "in between") and excerpts from her former teacher's freshly-published journal. Through a series of coincidences, Isabel meets Anzor, a highly passionate music lover from Chechnya, who manages to have business in many of the cities on Isabel's tour. Through a developing romantic relationship, Anzor introduces Isabel to a world of violence and extremism that she is not prepared to understand. The presence of music is everywhere in the novel, even, at one point, in its absence. I enjoy the way Hoffman's omniscient narrator "transcribes" the random thoughts of characters as they listen to Isabel's concerts, and the narrator occasionally enters into Isabel's own stream of consciousness while she is playing. It might be more difficult to end a novel than it is to end a piece of music. I found the novel's coda, which includes the reintroduction of a character named Marcel, who appeared for a short time near beginning of the novel (just before the first memory of Isabel's childhood) a bit heavy handed. The name of Proust comes up now and again in the novel, and Isabel refers to her childhood memories of shabbiness as "madeleines." The reappearance of Marcel makes the structure of the novel clear, but the way it calls attention to itself makes me think that the device of a coda works better in a piece of music than it does in a work of fiction. Hoffman's coda moves Isabel into unfamiliar musical territory that Hoffman is not able to write about with the musical authority she holds during the rest of the novel, but for people without my particular sensitivity to these matters, I imagine the ending, which seems to echo the ending of In Search of Lost Time, would be quite satisfying. Here's a review of Appassionata for NPR by Jessa Crispin that includes an excerpt from the novel, a link to the Other Press page that has another excerpt and more reviews. Here is a review of the book by Grace Andreacchi that came out after its 2008 UK release as Illuminations, and an online discussion about the book. Here's a conversation with Eva Hoffman concerning her 1989 memoir Lost in Translation (and a transcription of it). Here's a June 26th review Claire Hopley wrote for the Washington Times, and a June 28th New York Times review by Sylvia Brownrigg. 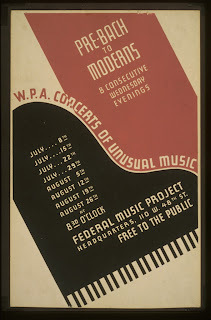 Concerts of new American music, written by living American composers, had a small admission charge. People interested in 20th- and 21st-century music, particularly film music (and who among us isn't?) should explore Pytheas talk, a fairly new blog which is an offshoot of the only slightly older Pytheas Center for Contemporary Music. Through this portal (which is the only word I can use to describe it with any accuracy) you can find meticulously organized links to audio and video recordings, along with listings of complete works for many 20th- and 21st-century composers, and links to dozens of articles about new music. I recently realized that I have been keeping this blog for more than four years. I started this blog under the influence of my husband Michael Leddy, who seemed to have found real happiness in his place in the world of blogging, and his varied interests make his blog really stimulating, often surprising, and quite entertaining. I started my blog as a place to put articles about music that had been sitting around for a while without a "home." This small collection of essays, profiles of people in the musical world I once knew, and quotations from books I was reading, eventually became a set of reflections on practicing, and my experience learning a new instrument as an adult. Sensing that I had an audience of (perhaps) like-minded people who found what I was writing about interesting, I started posting more often. As more musicians started keeping blogs, there were a lot of discussions across the blogosphere that I found engaging. I felt the beginnings of a blogging community, though, as with all communities, hierarchies started to appear, and some of the people who had made interesting contributions to the musical blog-scape stopped writing, or only write occasionally. It is through the blogs on the sidebar that I learn about much of the current musical world. There have been a lot of speculative posts about the future of classical music and the audience for classical music during the past four years. Now that we are in that future, it does not seem that (at least during the past four years) much has changed in the worlds of classical music, though the economy, the whole face of American politics, and the dynamics concerning international politics have. The size and power of the internet has changed though, as have the various devices and servers people use to access it. At some point in 2006 I realized that keeping my published music in a thematic catalog blog (including some that I had simply forgotten about) would be a very easy way keep it sorted and organized, as well as make it available to people who were interested, and In 2007 I started a class blog. I "borrowed" the idea from Michael, who kept a blog filled with resource material for students in his classes. I made a blog for my community college students filled with YouTube videos, portraits of composers, links to concerts in the area, and articles of interest. When I have time (and when I have ideas) I make several blog posts a week. This blog has allowed me to feel that I can participate in discussions in the larger world of music (albeit discussions in "parallel play," since very few people make comments), even though I live far away from the major centers of musical activity; and it has often become a kind of ladder of escape from a local musical culture that has grown in directions that do not necessarily involve me or my interests. I want to thank those of you who read this blog from time to time, and for those stopping by for the first time, I bid you a hearty welcome. Perhaps, if I got out more, I would not be so terribly sensitive to background music. I confess that there have been times that I have enjoyed background music, which leads me to imagine that perhaps, with the general desensitization to music and its constant availability that has quietly (and not so quietly) changed the way a lot of people think about music in the marketplace, perhaps background music has changed. Or, perhaps, it is actually being used for a certain kind of manipulation. I used to enjoy going to book stores. Sometimes the people working at book stores would have a radio up by the register, and I would enjoy the counterpoint between what was on the radio (over at the front of the store) and what I was thinking of reading. It used to be local programming--recordings put on a turntable or a CD machine by a person sitting in a radio booth somewhere within a 50-100 mile radius, who knew that part of the listening audience was made of people in book stores. Once in a while, during the CD age, people would bring in CDs that they wanted to listen to while they were working. And they tended to be sensitive to their customers. I would spend both hours and money in book stores (which I refuse to call "bookstores," by the way). Yesterday's book store experience (which I suppose, being at a mega-chain book store, should be called a "bookstore" experience), made it impossible for me to spend either time or money. The very loud country music that played over who knows how many speakers, along with horrible progressive-lens-unfriendly-lighting that made me wonder if I needed new glasses, or even a new prescription, made it impossible for me to concentrate. The rest of my family (all people who enjoy reading, by the way) found it impossible to stay in there as well. I contemplated the idea that the marketing overlords of this "bookstore" might be thinking of making the "bookstore" a place that would be uncomfortable to read, the way fast-food restaurants engineer their furniture in a way that makes it uncomfortable to sit for much longer than the length of a fast-food meal. Perhaps they want to discourage browsing, making it necessary for you to buy a book in order to decide whether you want to read it. I recorded this with the microphone in my Macbook. An external one would have given a better sound, but I wasn't able to find a configuration (given the various cord lengths) that did not produce feedback! You can see the music here. Greg Sandow asks what we can do about people thinking about the idea of classical music as being merely something "soothing." At the very least, there's a vast disconnect -- an abyss -- between the way we think about classical music, and the way our culture views it. All the turmoil and passion, all the towering grandeur, all the probing emotional truth, all these artistic things we like to talk about...none of them make much impression on the outside world? Perhaps there is nothing that we can do bring the larger population (or "our culture") to what has taken music lovers and performing and composing musicians the larger part of a lifetime to even begin to understand. Why do we musicians feel that is up to us to do something to augment the audience for classical music? My experience has shown me that only a small percentage of people really care about the music they happen to be listening to (in the background), and only a fraction of those people even listen to classical music. It also seems that the small percentage of people who do care about classical music is spread out across the globe, and within that small percentage, there are varying degrees of devotion. A wise bass player (I wish I could remember his name) once told me, "No matter how well you play, it's just someone's night out." There are a lot of people who think of classical music as an evening's entertainment; perhaps somewhere to take out-of-town guests, or to go on a date. There are people who will go to classical music concert because of a famous person who is playing, singing, conducting, or narrating. There are people who will go to a classical music concert to be impressed by a soloist's virtuosity. There are people who will go to a classical music concert because someone gave them tickets. There are people who will go to a classical music concert because they know someone who is performing. There are people who will go to a classical music concert in order to introduce their children to classical music that is performed by actual people (rather than being played on listening devices or on television). There are people who go to classical music concerts because listening to live music fills a great personal need, and there are some who go because the music brings comfort, and the venue offers community. There are some who go because they want to hear a specific piece being played, and there are some who go because they have to write a review or a paper for a class. I have gone to concerts for all of the above reasons. People don't go to classical music concerts without some kind of reason to do so. Perhaps it is not realistic for musicians to feel they are responsible for finding new audiences for classical music, when there is nothing wrong with the audiences we have, except for their size relative to the larger population. We do what we do regardless of who happens to be listening or how large the audience is, and I believe that if we change the way we give concerts (by playing only familiar repertoire, by talking to audiences, and by making concerts into "variety shows"), we could lose a portion of our audience. Composers write music pretty much for the pleasure of writing it, as well as for the pleasure of sharing it and hearing it played, although not necessarily by a large paying audience. Performing musicians will continue to practice, even if the listening audience is small (or even, in some cases, non-existent). Perhaps it is better, in this world of global communities, to enjoy and share our musical pleasures with those who care, wherever they may be, rather than worrying about convincing those in our immediate vicinity who do not care about listening to classical music that they should. It is certainly far less disappointing. This very short rehearsal segment warms my orchestral violist's heart. We are so often simply ignored.